As I was working on my final preparations for the 2016 Summer Olympic Games, I discovered I had missed an athlete who is now an Olympian. 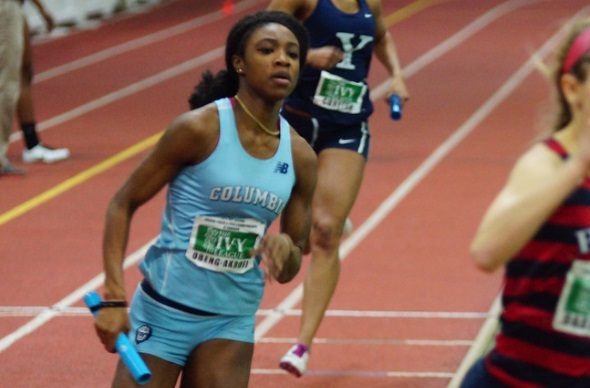 Columbia’s rising junior Akua Obeng-Akrofi will be going to Rio de Janeiro as a member of Ghana’s 4×100 relay team. Obeng-Akrofi has previously competed in Ghana’s 4×100 relay during the 2016 Penn Relays in the USA vs the World event. Columbia Athletics announced Obeng-Akrofi’s selection at the end of July. Obeng-Akrofi will join Rudy Winkler and Nikki Okwelogu as Ivy undergrads who are also Olympians, making her the 14th member of the Rio-Ivy contingent. Check out our full list of the 2016 Ivy Olympians – athletes AND coaches – on our side bar. Like we did in the 2012, we created an athletics biography for each person that summarizes what they have accomplished in their careers so far. Huge thanks to L. Kelsey Armstrong, Nell Smith, and Becky Wexler for creating these bios! The Opening Ceremonies will commence on Friday evening, with NBC televising the ceremonies starting at 7:30pm ET (note – the television broadcast will be on an hour tape delay as Rio is one hour ahead of the ET time zone). This entry was posted on Wednesday, August 3rd, 2016 at 11:26 am. It is filed under Olympics, Spotlight. You can follow any responses to this entry through the RSS 2.0 feed.